Checkweighers with a belt smaller than three inches wide are designed for smaller items, such as pill bottles. This type of equipment ensures correct weight of a product for quality control. The product is conveyed over a scale, and if it is too heavy or too light the checkweigher removes the product from the line. Some checkweighers sort the rejected objects into piles. Usually, this can be accomplished with a push-off rejector, arms or a sharp blast of air that redirect the unfit product. 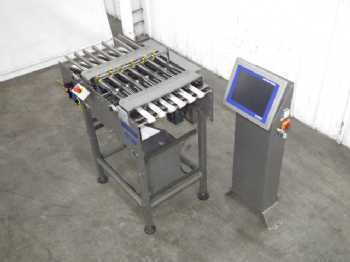 Belt checkweighers are designed with different length load cell conveyors. Belt checkweighers are often designed so that the package does not have to stop on the load cell conveyor.